piiman ピーマン(borrowed from the french word poivront, which means “bell pepper”), look like green bell peppers which have hit with a shrink ray. based on appearances, they differ from larger capsicum annum (e.g. the green sweet bell peppers we can get our hands on in the states) based on size alone. their internal anatomy, color, and waxy sheen is exactly the same. but as the old adage goes, you shouldn’t judge a capsicum by its color. although they are pretty cheap and can be found all year round, piiman can be tricky to cook with. their texture and flavor is fundamentally different than the big, fat, juicy green bell peppers available all across the united states. they have an earthier taste and extremely thin flesh, which makes them particularly prone to overcooking. the soft, mushy, pale strips of veggies that result are the bane of nearly every grade school across the great nation of japan. their thinness and relatively strong flavor necessitate different cooking techniques; instead of baking, they are almost always stir fried or grilled for short periods of time over very high heat. i don’t loathe piiman, but i never really raved about them either. when they show up in school lunch, they invariably take the form of chinese pepper steak, which the japanese refer to as chinjao rosu 青椒肉絲. there is certainly nothing wrong with thinly sliced pork, bamboo shoots, and sliced piiman sautéed in a little bit of sweet soy sauce. but it doesn’t exactly knock your cuilnary socks off in the flavor/texture department. last year, i finally took a liking to piiman due to the concerted efforts of an 85-year-old grandma, her 90-year-old deaf husband, and ken-chan, their rotund son in his mid-50s. the three of them owned and worked in a restaurant a few blocks from a community center where the junior baseball team i tutor used to practice. twice a week, i would leave school, eat dinner at their restaurant, have a chat with the old couple over a cup of tea or two, and then head to the community center to train train with my kids. never once did i order anything. every time i came in, ken-chan would ask me whether i felt like meat of fish that day, and based on my response he would make me a set meal (which the japanese call teishoku). my obligatory bowl of rice and cup of hot green tea was always accompanied by a five or six bites of a few dishes, all different in flavor and texture. 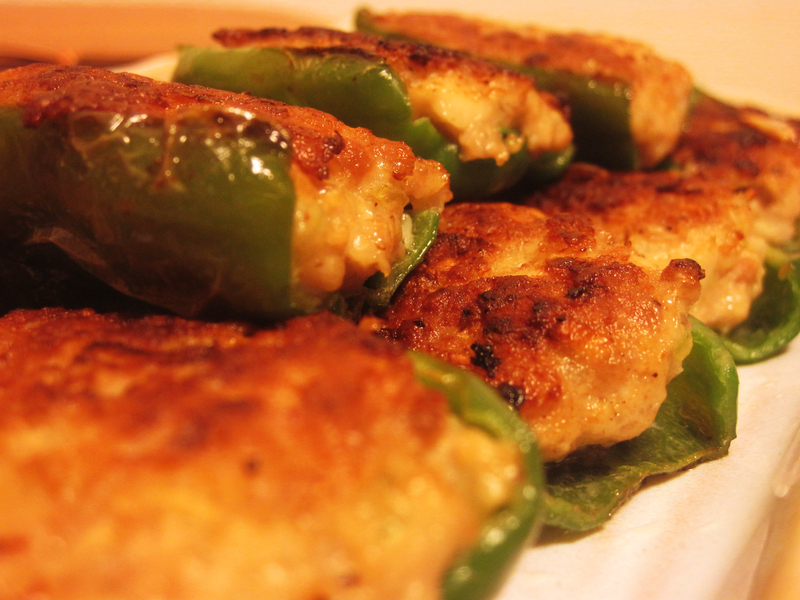 every once in a while, they would whip up a batch of piiman stuffed with a mixture of ground meat and veggies. they weren’t anything complex, but their simplicity was what made them so darn magical. their stuffed piiman had just the right amount of umami, salty, spicy, and sweet. it was love at first bite. eventually, i even convinced her to teach me how to make them at home. her one condition was that i use the recipe only for good, never for evil. of course i readily agreed. peel the ginger, garlic, and onion. use a sharp knife to mince them super finely. mix in the meat, egg, breadcrumbs, sesame oil, and black pepper to taste. the mixture should be thick enough to form into defined meatballs. if it is too aqueous, add a little more breadcrumb to the mix. put the meat mixture into a ziploc bag and set it in the fridge for an hour or so to let the flavors set. slice the tops off of the peppers, cut them in half lengthwise, and remove the seeds. do your best not to break off the veins, they will help to keep the meat in. sprinkle a little bit of flour into the inside of each pepper half, then rub it in using your finger tips. this will help keep the meat from sliding out as soon as the pepper soften. press the meat mixture into each pepper half. try not to fill them too much, but make sure the meat makes a snug fit. air pockets are not in your best interest. add a little bit of oil to a large frying pan. once the pan is hot, place the peppers in pepper-side down. as soon as they start to blister, flip them. once meat side down, allow them to sizzle for a few minutes, then cover the pan and let the residual heat soften the peppers just a little. start to finish, the cooking process should never take more than six or seven minutes. plate the peppers, and then drizzle a tiny amount of soy sauce over the top. sprinkle them with a little shichimi, and bring with out alongside a piping hot bowl of rice. a tall glass of cold beer never hurt, either. This entry was posted in culture, dinner, japanese food, snack and tagged Drinking, Easy, Green Peppers, Japanese Food, Man Food, Piiman, Stuffed Peppers. Bookmark the permalink. ← japanese tuna salad rolls: a bound salad set free. Could I do this with poblano peppers which are readily available in this neck of the woods? Seems like a very flavorful variation on a regional favorite, the chile relleno. What do you think? heck yes, poblanos would work. i think you need to be careful with mixing poblanos and ginger. in my experience, the poblano has a little bit of a acrid, acidic taste that might change the flavor of ginger and sesame oil. just exercise a little caution, and do a little taste testing before you make a big batch. good luck, and let me know how it goes. i’m super interested now. honestly olivia, i was exactly the same. when panfried with a bunch of aromatic vegetables, the difference is hardly noticeable. but try taking a bite out of a piiman and then taking a bite out of a big juicy green bell pepper. the difference will amaze you. how was sibu? it looks like your grandma made all kinds of good stuff while you were in malaysia. Thanks for the advice! Apologies for the late reply- I’ve been trying to keep Internet usage to a minimum while I’ve been here! Sibu has been really good thank you! Spending time with my grandma has been a lot of fun especially with all the good (and cheap!) food here! Have you been to Malaysia before? i wish. malaysia, the phillipines, indonesia, and singapore on all on my “to travel” list, but i have a lot of friends who grew up there going to international schools. i’ve heard the local cuisine is amazing and (just like you mentioned) super cheap and available almost anywhere you go. any local dishes you recommend above all others? And there I was hating ant eater (yes, I’ve tasted it) and liver. Ahh to be more interesting! liver could be one of the world’s most poorly prepared foods, so i understand that one. i was blessed with a mother who made awesome liver and onions, so i took a liking to it at a young age. ant eater? i can’t imagine what kind of flavor that meat has. i’m curious now. please describe to me what you hate about it. Well I was just a child, but I was in the Amazon — and well — for one. It eats ants all day. ANTS. To describe to you the bitter, greasy, gristly meat… there aren’t words. It didn’t taste like chicken. It tasted like ants. Millions of ants. It was pungent. The entire house stunk of it for days. No one would eat it, not even the adults. So we left it outside for the dogs, the dogs came within a few feet, sniffed, and ran away. Not even the dogs would eat it. So I suppose I hate everything about it really. The fact it existed. The fact it stunk. The fact that it tasted like eating bitter, acidic little ants. that sounds truly awful. i’ll make sure to pass if the opportunity presents itself any time in the distant future. while your vivid description of the horrors of anteater meat were a great read, i can’t help but be nosy. what were you doing in the amazon as a child, shandi? that is a pretty cool childhood memory that is so far removed from my own experiences as a pup that i had to ask. Well I’m sure you’re heard of the elusive homeschool-youth pastor-missionary kid right? Now you’ve.. “met” one? Although in the Amazon I was just a regular old homeschooler missionary kid. ;) My childhood memories feel normal in my head and then I say them out loud and realize that no everyone remembers their mother’s feet covered in fire ant bites from standing in an anthill while she hung the laundry on a line a few hundred feet from the Orinoco after hand wringing her clothes from being washed in a tiny archaic wringer washer. Or you you know, how their dad’s took billions of photos of frogs, toads and other creepy insects to cherish forever. Or how fear of being sprayed by a tarantula was just a kind of every day thing. impressed, amazed, and a little jealous, too. as a baby raised in missouri, i mostly just played with piglets when i was little. Oh, oh! I lived in Missouri for awhile as a baby too! (Don’t even ask, I’ve lived all over the place). Although I guess you need the context of me being Canadian for all of this to become more complex. I’ve just moved a lot. so it would seem. shandi, you have just become far and away one of the more interesting people ever to have read my blog. I like to think my posts are pretty funny. At least my boyfriend tells me that…. but you know, he wants to eat..